While the 2012 election is over and this article–originally posted on my previous blog–is less relevant to the times, it is still important to look at the last GOP primary with a critical eye. While Romney was the eventual nominee, many fail to remember that the Republican Party very nearly nominated a lunatic like Bachmann for consideration to the most powerful office in the land. This consideration indicates a deep sickness within the GOP and is something that we cannot ignore, even after the election is over. For your consideration and amusement, here is a commentary on the debacle of the 2012 GOP primary, written when it was still going on. This isn’t new news, but I hope that you enjoy it, regardless. As the 2012 presidential primary deadline comes closer, it is becoming increasingly evident that the Republican primary is not actually a political race—it is actually a brilliantly designed and executed reality show. Each of the political candidates on the stage represents a different segment of the Republican party and, as with many reality TV shows, the entire purpose of the primary is to “vote them off the island” in order to determine which contestant remains to get the big prize. 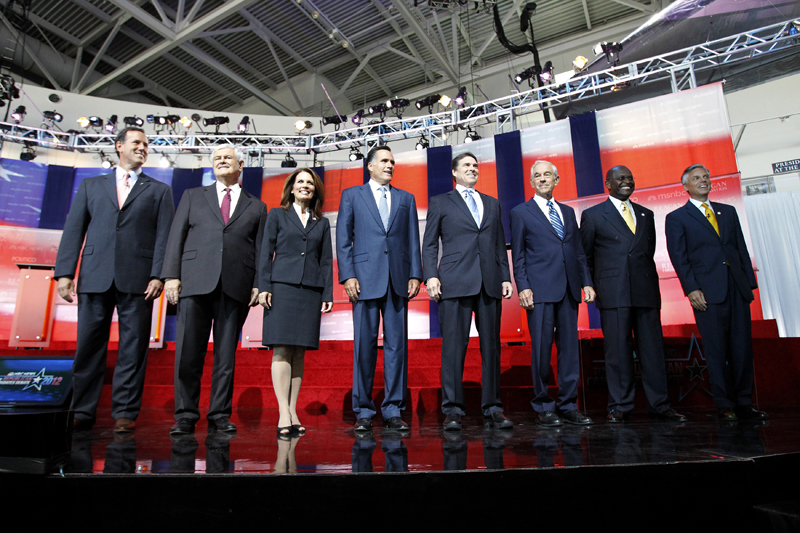 Ironically, in addition to the reality show format of the 2012 Presidential debates, each of the candidates on the stage represents a standard player archetype from actual reality shows. When I refer to the Republican primary process as being a game show, I don’t extend this to past election cycles. I have no right to completely deride an entire party’s ideology as, in the USA, everybody is entitled to their opinions. I may not agree with the conservative narrative, but that simply means that I will argue the issues with anybody who holds conservative views. Unfortunately, the current Republican Party has gone insane and divorced itself not only from the facts, but from all political convention; unlimited money and partisan distillation has allowed a very well-funded core of completely unqualified and extremist candidates to take over the right wing narrative. The Republican Party is no longer a legitimate political party, but a caricature of the extreme right wing brought to life; they are crazy, ill informed, hyper-religious, bigoted, and proud of it. No outsider can argue with a party that has disregarded all facts, as all members of the party are creating a new narrative that they consider facts. When I see the current Republicans, I am reminded of the scene in “Alice in Wonderland” where Alice meets the Mad Hatter and tries to apply logic to an illogical mind. It is this degradation of the sanity of the party as a whole that has brought about the situation where an entire presidential primary race can be looked at as a reality TV show. The “Republican Primary Show” is a reality game show where numerous conservative politicians get together and attempt to win the grand prize of the party nomination to the office of President; the runner ups receive prizes such as Fox TV shows, book deals, and speaking engagements. This game show is virtually no holds barred and the audience expects blood—they boo gay soldiers while cheering executions, torture, and war. The game show aspect of the primary plays out during over a dozen televised debates, where contestants compete for the hearts and minds of the audience. Contestants must walk a fine line during the “episodes” so as to simultaneously reject reality enough that they are seen as true conservatives, while not appearing completely insane. For example: Rejecting evolution, climate change, and Obama’s policies are mandatory, yet claiming that vaccinations cause mental retardation is simply a step too far. If the candidates are too sane, they have no chance to win the game as the right wing audience will hate them (Huntsman Syndrome), but they must at least appear rational and balance in their rejection of reality so as to avoid being seen as unable to hold the office (Bachmann Syndrome). Mitt Romney: Representing the plutocratic segment of the Republican Party, Romney is the contestant that everybody knows is the favorite but nobody wants to win. The dislike of Romney goes far beyond the customary rooting against the establishment and into a category where the race has two real candidates; Romney and the “Not-Romney”. In reality show terms: Romney is the skilled and intelligent contestant who everybody on the show wants to take down to make a name for themselves and everybody in the audience wants to see taken down. Rick Perry: Representing the Deep South ultra-conservative segment of the Republican Party, Perry is the contestant who shows initial promise to take down the favorite but then falls to self-inflicted wounds before he can even face his rival. In reality show terms: Perry is the contestant who comes on strong and appears to dominate the first half of the game, but then stumbles on his own inadequacies in front of the audience, thus killing his momentum before the game even ends. Michelle Bachmann: Representing the anti-everything, Tea Party segment of the Republican Party, Bachmann is the wild card candidate who comes onto the scene as a whirlwind and leaves just as quickly. 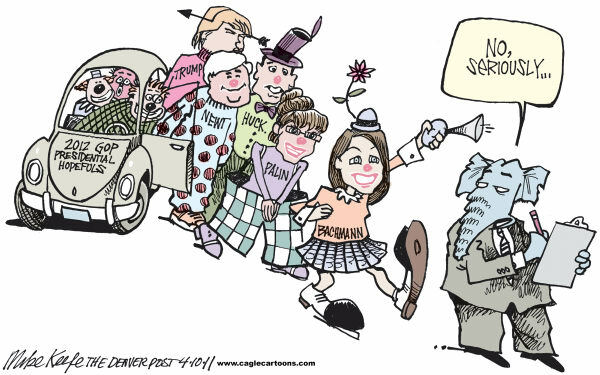 In reality show terms: Bachmann is the flash in the pan contestant who everybody knows is insane, but is kept in the game because she is so amusing to watch. Nobody thinks that she is going to win, but other contestants like her because she makes them look balanced and the audience sees her as a constant source of amusement, thus she is allowed to remain on the stage. Newt Gingrich: Representing the entrenched, 20th century establishment segment of the Republican Party, Gingrich is the undead contestant—he is ugly, mean and smells to high heaven but, every time it looks like he has fallen out of the contest, he pops back up stronger than ever (and slightly more aromatic). In reality show terms: Gingrich is the antagonist who nobody on the stage likes and the audience will only support if he will take down a contestant that they hate even more. Ron Paul: Representing the Ayn Randian libertarian segment of the Republican Party, Paul is the crazy outsider who looks progressively saner as his competition degrades with time. The current Republican Party has moved so far out to the right (and away from reality) that Ron Paul is one of the more moderate, balanced and consistent candidates. In reality show terms: Paul is the cross season candidate who everybody knows and many like, yet will never win; he just keeps coming back for more every season, while the show degrades around him (Example: Survivor). Herman Cain: Representing no particular demographic of the Republican Party, Cain is the comic relief candidate who many find amusing until his antics stray into the distasteful and he is shunted off of the stage. Modeling your economic policy off of Sim City and quoting Pokémon music are comic relief but allegations of sexual assault are not, thus Cain the jester becomes simply an embarrassment (A heroic accomplishment considering this field) to be voted out of the competition. John Huntsman: Representing the sane segment of the Republican Party, Huntsman is the lone voice of sanity in the right wing wilderness. I won’t use reality show memes to describe Huntsman as he actually deserves better; he is an old school Republican who, while very conservative, still lives in reality and subscribes to science. In any other situation, Huntsman should be the frontrunner in the pack of fools, lunatics and flip-floppers that he is sharing the stage with. Unfortunately for Huntsman, being the sole sane person in an asylum filled with the insane is a lonely position and not one that has any chance of growing into a nomination. I would just like to conclude with two comments: One for Democrats, the other for Republicans. To Democrats: You must fight back against the insanity of the right wing if you want the USA to resemble anything that has been in the past or is now. If you stop pushing against the right wing agenda and the weakness of your own politicians, we will live in a fascist theocracy within a generation. Money and religion have bought the other side and will use their influence to shape the country if there is no pushback. The 2010 election demonstrated what happens if you don’t go out to vote and remain active in the political process; a bunch of crazy, corrupt lunatics take over the government and bring us to hostage situation after hostage situation in order to get a partisan agenda passed. To Republicans: Look at what your party has become. Your politicians are neither conservative, nor are they principled in any way. The Republican Party only serves the rich and will bring about the downfall of the USA if allowed to take over. Republican politicians spend huge amounts of money giving tax cuts to the rich (but never to the poor, as demonstrated by the payroll tax fight) and cut safety regulations. If you support the middle class, safe workplaces, public education, a secular society, civil rights or a clean environment you simply should not be a Republican; if you support any of those ideals, either make a new party or push for reform inside of the Republican political establishment quickly.